Hortus Camdenensis | Brunfelsia hydrangeaeformis (Pohl.) Benth. Frost tender shrub with oblong-lance-shaped leaves, to 30cm, and terminal cymes of up to 50, purple flowers, with tubes to 9cm long, in spring. To 2m. [RHSD, Hortus]. 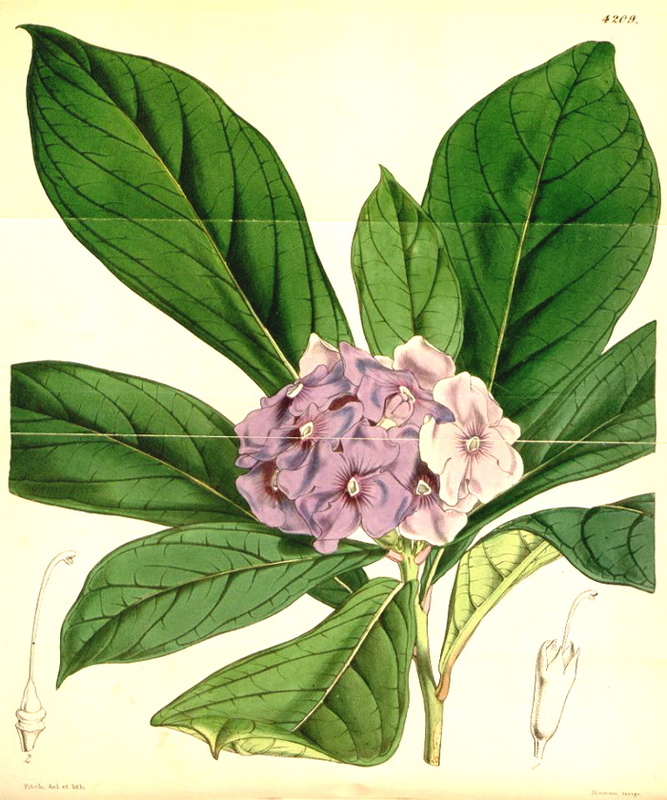 ‘Ever since the publication of the 1st fasciculus of Pohl's splendid work on Brazilian Plants, it has been an object with collectors and horticulturists to procure the F. hydrangeceformis for cultivation in our stoves. Pohl found it at Olaria, near Rio Parahybuna, in 1818. Mr. Gardner was so fortunate as to meet with it, in the Organ Mountains, (n. 563 of his collections) in 1837; and he wrote from Rio, upon the label attached to our specimens, "this, from my recollection of the figure, I had considered to be F. hydrangeaformis of Pohl; but by the kindness of Mr. Miers I am informed that Pohl's description is 'bracteis lanceolatis pilosis ciliatis, calyce hirsuto'; while here the bracts and calyx are quite glabrous. It is a shrub, about four feet high, growing in rather moist places in virgin forests, and attaining an elevation, upon the hills, of about 4500 feet. All the species are called Manacá (the Indian name) by the Brazilians, and this receives the name of Manacá dobrado. It is a beautiful plant; but does not ripen its seeds freely. I have only been able to procure a few, which I send." These seeds have been reared in Glasgow and Kew, and from the produce of them our present figure was taken.’ [BM t.4209/1846]. ‘This is the most elegant species of the genus, with the aspect of Hydrangea hortensia.’ [Don[. Seed was sent by Pohl to Kew and Glasgow in 1837. [MB p.121/1846]. Listed in the 1850 and 1857 catalogues [T.455/1850]. Obtained from Loddiges’ Nursery, brought out from England by Captain P. P. King in 1849. [ML A1980-3].